Published in the Vancouver Observer. Food Talks Volume 3 is on August 14th. I don’t want to see asparagus in the middle of December. I don’t want to see strawberries from Kenya in the middle of March. I want to see it (vegetables) home grown. There should be stringent laws, fines and licensing laws to make sure produce is only used in season. These words, although not verbatim, were echoed at Richard Wolak’s first edition of Vancouver Food Talks. Gathered at W2 Media Cafe were a group of individuals who are passionate about locally sourced food and where the items that are going on their plate are from. These are topics many people are interested in, but it takes a certain type of person to go above and beyond to ensure that we are living sustainably and setting ourselves up for a healthy future. The speakers presenting that evening encompassed this idea and presented us with information on how we can do our part to help. The event captured all levels of food from farm (or ocean) to fork, with Roberta LaQuaglia of Vancouver Farmers Markets, Mike McDermid, from the Vancouver Aquarium, Hunter Moyes, founder of the Tiffin Project, Trevor Bird, of Fable Kitchen and Stephanie Yuen, author of East Meets West. Of course at any food related event there must be food. Chef Karen McAthy of W2 Media Cafe supplied guests with a delicious array of local Aboriginal appetizers with Indian influence. The first speaker of the night was Mike McDermid discussing sustainable seafood and his role with Ocean Wise at the Vancouver Aquarium. He began by stating that two things he’s fond of are Jacques-Yves Cousteau and food. Cousteau, liked to call himself an “oceanographic technician” but in reality he was a sophisticated showman, teacher, and lover of nature. His work permitted many people to explore the resources of the oceans, so in a sense he paved the way for Mike and other like-minded individuals. Oceans make up 70% of our land so how can we not protect them and the creature that inhabit them? Oceans are what define us; they are what make us unique in the solar system, they moderate our climate and supply us with food. In fact, 1.2 billion people rely on seafood as their main food. Mike started volunteering with the Vancouver Aquarium and years later…well he’s still volunteering. But volunteering is about helping out something you’re passionate about regardless of money and he certainly has passion for was he’s doing. The number one concern that Ocean Wise faces is fishing. This leads to one of their goals of empowering consumers to make the right decisions on seafood they’re purchasing and eating in restaurants. Since chefs are great at relaying information on the food we eat, they decided to target them, asking them to opt for Ocean Wise seafood. Initially they thought that chefs wouldn’t want the Vancouver Aquarium telling them what to cook, but to their surprise many chefs were on board with the idea and in the first year first year 27 restaurants became involved. Soon after people were calling worldwide and they now have 3,100 active sources across Canada, from Victoria to St John’s. Anthropologist, Margarette Mead’s quote resonates with Mike and stands true for how Ocean Wise has grown to be so successful. Our next speaker was Stephanie Yuen. Stephanie Yuen was one of the first Asian people writing about food, and we know that with the amount of food bloggers these days that the number has grown exponentially. She started off her speech by presenting her book, East Meets West, on each chair, stating with a smile that she may as well take this opportunity to advertise. She also mentioned the tagline of her book (Traditional and Contemporary Asian Dishes from Acclaimed Vancouver Restaurants) and offered a free book for the individual who remembered it. Right from the get-go Stephanie’s presentation was like a comedy with a message. “Well Mike saves the world, I save my belly.” She joked. Stephanie is a seasoned freelance food and travel writer, and a published author, among other things. Her book, East Meets West is a compilation of Asian dishes in honor of the myriad of Asian restaurants that give Vancouver its title as one of the best places in the world for Chinese food. “Have you seen any Chinese restaurants in Vancouver? Unless you live in the woods, you’ll see one almost every day!” This is a fairly accurate statement as almost one in five of Vancouver’s two million residents is ethnically Chinese, and the city supports more than four hundred Chinese restaurants. She addressed many topics in her speech including the use of shark fins in Chinese cooking and her role with SharkTruth , a non-profit organization striving to protect the sharks. In the last year 70-100 million tonnes of sharks were slaughtered. Stephanie has heard Asian people say that “it’s just like killing a pig.” It’s saddening how oblivious some people can be. When killing a pig they use ever morsel on the body, when killing a shark, they are doing it specifically for the fin. She does however see a lot of young people involved, which makes her hopeful and able to see a light at the end of the tunnel; The younger generation is realizing the consequences of their actions. She also touched upon farm fishing and caged animals used in cooking. “Fresh means swimming right?” Stephanie said, in reference to why anyone would eat farmed fish and consider it “fresh”. With a multitude of vegetarian ingredients used in Chinese cooking, like gai lan, eggplant, bok choy, daikon and Chinese broccoli you could spend a month eating Chinese without seeing lamb or steak. That said there are many dishes used in which shrimp is common as well as pork and chicken. Her lightheartedness didn’t detract from her message, rather the opposite as it kept everyone entrapped in her words and retaining her overall message. Third speaker of the night was Hunter Moyes. Imagine how much of a positive impact on the environment there would be if there were no take-out containers, especially, god-forbid, non-compostable ones. Unfortunately this seems but a dream, unattainable in today’s society where it seems to be more common to get food to go then it is to prepare a lunch for work. Hunter spoke to us about the Tiffin Project, a campaign with hopes to influence environmental and social change through food. This is a project, not a solution. Three key issues that Hunter discussed were local vs. imported produce, waste, and food security. He intends on addressing these issues through “tiffins”, which are non-disposable take out containers. Check out his infographic, which best displays how it will bridge the gap between local and imported food and help support farmers, restaurants and consumers. In brief he told us the story of how the idea came to mind with the idea triggered through his time working at Burgoo. He realized that in a year of grossing 2 million dollars they were using thousands of take out containers. This is nothing compared to Noodle Box which has a 60/40 takeout to eat-in ratio, adding up to 75 thousand take out containers in one year! Like any good idea, it’s probably already been done. In this case, Hunter didn’t invent the idea; he’s simply expanding on it. It originated in India in 1880 as a meal delivery system where hundreds of thousands of meals are delivered and catered without waste. In Vancouver Shaffeen Jamal, a restauranteur, has been selling and using tiffins for years with Curry 2 Go. Hunter’s expansion on the idea means connecting local businesses throughout Vancouver to adopt the tiffin in to their daily use. His vision is not merely to reduce landfill waste but to also support local farmers. The reason that we don’t eat more locally in Vancouver’s restaurants is because of the current price gap between local and imported produce. Chefs use price, and convenience, as justification for sourcing their menus from the imported items that large-scale distributors favour. The Tiffin Project will serve as a subsidy program to bridge that gap, so that Chefs have no excuse not to strike up sustainable relationships with local producers. Together, we can be expediters of the re-localization of our food systems. As a chef, Hunter understands how difficult it is to purchase local food when it comes at a premium price. But with the $4 profit margin on the tiffins the extra money can be spent on buying local food and researching ways of eliminating food waste. As a consumer, what’s in it for me? It is human nature to wonder what the instant gratification of any project is, and this desire doesn’t go unsatisfied with the Tiffin Project. There will be an incentive for those who bring in the take out containers to participating restaurants including Nuba, Noodle Box, Curry2Go and soon Fable Kitchen. At Noodle Box for example they will offer $1 off, while Curry 2 Go offers Tiffin Thursdays (curries at reduced prices) and Nuba has created a separate tiffin-specific menu. I agree with Hunter in saying “the Tiffin Project is a win-win-win situation for the environment, food-lovers, and the current economics of food systems.” Follow his project on Twitter: @TiffinProject. Following Hunter was Trevor Bird. Trevor Bird who claimed he had nothing prepared spoke mainly about his recent fiasco on Top Chef Canada. He spoke very humbly during his speech with shout-outs to Top Chef Competitor and winner Carl Heinrich, stating that he drew a lot inspiration from him. The jump from working as a chef de partie at the Shangri-La hotel to a competitor on Top Chef Canada was quick and dirty. Trevor didn’t submit an application video, he simply made a phone call and the rest was history. After showing his prowess in the kitchen with his olive oil poached char in fennel marmalade, there was no doubt that he was suitable for the competition, and no surprise he made it the top two. To paint a picture of the prep of this dish, he said it is like having a fish bathe in oil; it has to be the right temperature. When they called him to tell him that he got in to Top Chef, they were surprised that he didn’t sound excited. Why? And a lot of work it was, but although not winning the competition he grew professionally and is now a notable chef in Vancouver, which isn’t an easy feat. As someone who was rejected multiple times by restaurants such as Abigail’s Party and Hawksworth, and declined a promotion within the Shangri La, he can be sure they’re kicking themselves now. This is also part of the reason he was coined “the dark horse” during the competition. This then led in to him speaking of Fable Kitchen, his new restaurant and where you may have the opportunity to try his now “famous” dish. “I’m living a dream; this is why I started, what I aspired to do. Top Chef gave me the upper hand.” Trevor said in reference to opening up Fable, where his menu focuses on locally sourced, seasonal and sustainable food. He firmly believes in farm to table food and stresses the importance of knowing who gives you the food. That said, he acknowledged the fact that just because it’s local, doesn’t mean it’s sustainable. It’s all about proper education, which is why we’re so lucky to have so many passionate organizations and chefs that are encouraging and sharing open information. Last but not least was Roberta LaQuaqlia. It’s only natural that we would talk about where the food comes from at an event like this. Roberta is the longest serving employee of the Vancouver Farmers Markets. She’s seen it grow exponentially since they began, as more and more Vancouverites are become aware and concerned about the source of their food. The public has taken to the farmers markets and often community is developed through them, creating small villages with temporary stalls. Markets have a vibe; they equate to laughter, good times, music, and food. There’s a pride associated with it farmer markets as well as people are very passionate about their local market, considering the one they visit their own and sometimes rarely venturing in to other neighbourhood markets. Vancouver Farmer’s Markets are grateful for their customer base but it can be an exhausting effort all the same. But what happens when many of the farmers who have been working the land and providing local food retire? The average age of BC farmers is 54 so it won’t be long. Therefore, new farmers need to get introduced to the community so that the current generation can retire while passing on their knowledge. In 20 years we`ll have to rely on local food and if we don`t know how to utilize the land to harvest food and build a sustainable lifestyle then we`re going to run in to some major problems. The message from Roberta was mainly to encourage us to support local farmers and pay the premium now for local food, so we don`t have to pay the price later. In good fun, but certainly not a bad idea, Trevor suggested we should have a movement for Next Celebrity Farmer. At the end of the speeches there was a door prize draw with a variety of gifts including four bottles of Misconduct Wine and a handful of Stephanie’s books. There was also an opportunity for Q & A with the audience, where a lot of fantastic questions were asked by the eager audience and answered by the knowledgable panel. Wine that evening was from Misconduct Wine and with each ticket the guest received a glass. Exclusive macarons were made for the event by Soirette Macarons and contained a note that said “Fire It Up” with three matchstick macarons with a hint of spice, chocolate graham cracker macarons and home-made marshmallows on a skewer. A donation of $3 from each ticket went to supporting Growing Chefs, an organization that supports and encourages the development and growth of children’s urban agriculture while providing an avenue for chefs and growers to engage in the community and to support food sustainability. Each edition of Food Talks will be supporting a different charity. For more high resolution photos check out my gallery. 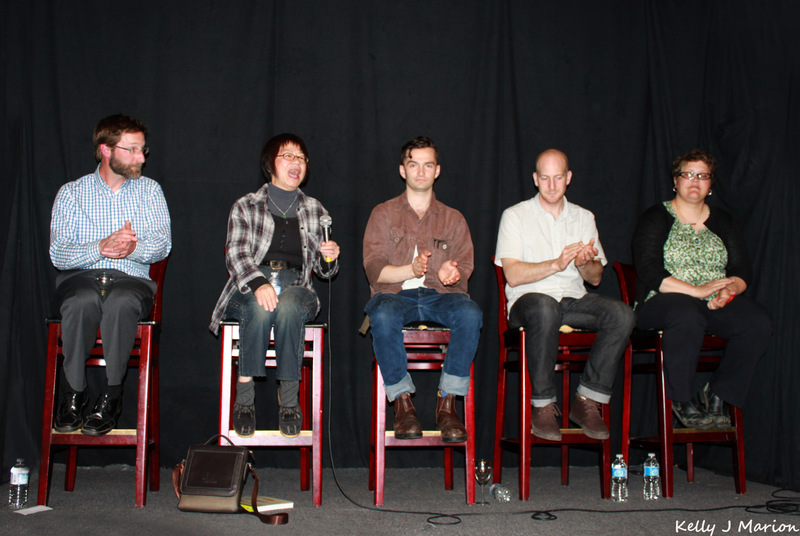 Read a recap of Food Talks Volume 2 by Ariella Fong.